Faithful Thinkers- Defending God's Existence and Compatibility of Science with God and the Bible: Is Education Overrated? "Is our quest to give students ever-higher levels of education and credentialing based more in vanity hits than in true knowledge and understanding of the world?" That alone warrants this article for reasons that I will discuss shortly. But also happening in my home state of Oklahoma, as I write this blog post, is a dispute between public school teachers and law-makers regarding funding (you can check out any of our local media for the stories). As I have been involved in discussions at work and on Facebook about this local situation I recalled the content of the article above, that I believe may help explain how our education system got to producing the disrespectful display we have witnessed on both sides of the dispute. Let me get straight to my point. Of all the worldviews that could have been ostracized from our education system, the one that was is Christianity. If the true worldview is removed from our education system, then knowledge and an integrative understanding of the world could not be its focus. Not only is the true view of the world not allowed to be discovered, but that true view of the world is the only one that can even ground the reliability of our cognitive faculties (what allows us to know things). (see Alvin Plantinga's "Where the Conflict Really Lies" and Greg Koukl's and Frank Beckwith's "Relativism: Feet Planted in Mid-Air," respectively, for a detailed treatments of these claims and how Dewey is correct if naturalism is true). 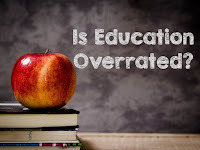 Dewey began the transformation of the education system to reflect the teaching of pragmatism (survival of the fittest) instead of the teaching of knowledge, and we see its effects today, especially in articles and events such as the ones that triggered this blog post. Since the true worldview (and the one worldview that grounds the ability to gain true knowledge and understanding about the world) had been removed from our education system, knowledge and understanding could not possibly the its focus. I want to be as clear as I can be here. This is not a "could not" of permission but a "could not" of existence. Because of the lack of existence of the possibility of knowledge and understanding of the world in schools (yet schools still needed to teach something to justify their existence and requirement upon the people), something else had to take the place of knowledge and understanding. Because survival of the fittest is the goal of this education system and the next step from school is into the workforce, credentialling seemed the most practical option to replace true understanding and knowledge of the world as the focus of the education system. Promotion of the appearance of greatness tends to be more visible and more heard (thus more valuable to survivability) than true greatness- giving the person who appears great the competitive advantage in the corporate world. Thus the focus on credentials naturally leads to artificially inflated egos and vanity- the concern of article's author. Of course this is not to say that knowledge of the world is not taught to some extent, but that is not the goal (the goal of knowledge is what cannot exist without a ground, knowledge can still be obtained accidentally without a goal being present or even possible), and the knowledge that is taught is very selective based upon its pragmatic value for producing credentialed graduates. What is interesting is that it all makes sense in a naturalistic universe (atheism)- the pursuit of survival (pragmatism) is primary, while the pursuit of knowledge is, at best, secondary. The attainment of survival skills is intentional, while the attainment of knowledge is accidental. The achievement of credentials is the grand prize, and the achievement of understanding is the consolation prize. 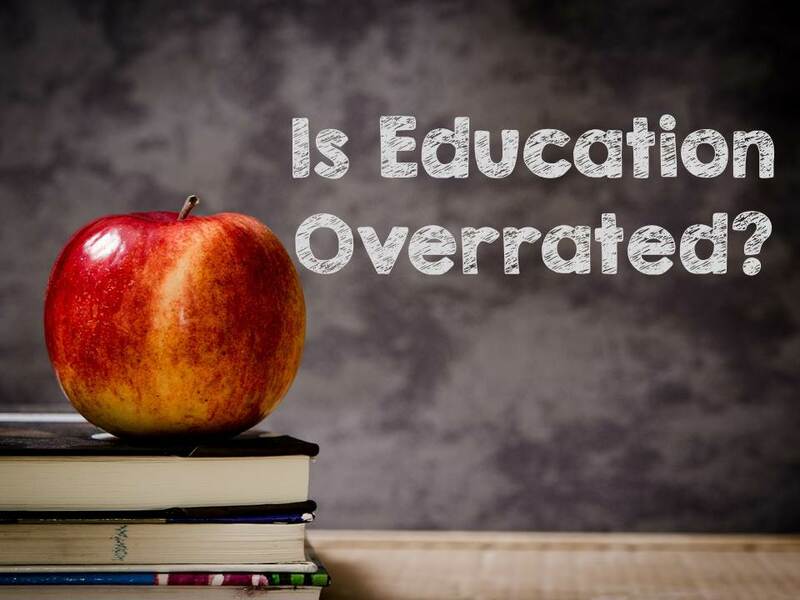 So, is education today overrated? I say, "yes," because its goal is ultimately fleeting, a chasing after the wind. The education system produced and currently enables a vicious cycle of futility that has no ultimate purpose beyond a short-sighted benefit of power and authority in the workforce (see "Can We Have Purpose Without God" for more details). This now brings me to the 2018 Oklahoma public school teacher walkout (which is happening as I write this post). This was the result of a dispute between the teachers and law-makers. Simply put, the teachers wanted more money (for raises and other funding), and the state budget had already been allocated. More funding for education (the desire of the teachers) is, indeed, a noble request, and fiscal responsibility (the desire of the law-makers) is also a nobel request. Now, the teachers are dependent upon the law-makers to give them funding (whether it is by raising taxes, reducing other budgets, or a combination), and the law-makers depend upon the teachers to graduate students with survival skills (read "credentials"). Unfortunately, both sides are shouting at each other, threatening, and emoting. They see the other side's concerns as antagonistic to their noble desires. At this point both sides appear to only see "all or nothing" as the only possible solution, and complete failure if they do not receive everything they desire. It appears that not a single teacher and law-maker pair have set down together to have a rational and thorough discussion of the situation to work out a reasonable compromise. It appears that the education system's focus away from a true understanding of how the world works (and focus is now on individual credentials) has led to specialization so accute that, at least, one of the sides is unwilling to even recognize the existence of another part of the world and the necessity to compromise to obtain an overall optimal solution. If even one party in a dispute is unwilling to recognize the noble goals of the other (which often includes a portion of the world that exists outside their own turf- where they hold credentials), the possibility of compromise is greatly reduced and possibly non-existent. Yet someone has to win in the dispute. It seems like both sides appeal to power, fear, emotion, and everything except a true understanding of the situation and how the world works (on both sides). If the system that educated them had been focused on a true understanding of the world, such fallacious appeals (taught in basic courses on logic) could have been avoided, and this dispute could not only have been resolved before the writing of this blog post (it hasn't yet), it may have never happened in the first place. Our overrated education system failed our law-makers, who are products of it, our teachers, who are teaching within it, and our kids, who are the new victims of it. As long as the education system refuses to refocus away from credentials to knowledge and understanding of the world, these problems will continue, will get worse, and will eventually cause the system to implode. Unfortunately, I do not have much hope for the education system as it curently stands because it is run by a government that is bent on keeping the true worldview (and the one that grounds the reliability of our cognitive faculties to discover what is true about our world) out of it. Any institution that chases away the foundation of the reliability of our cognitive faculties surrenders its pursuit of knowledge by necessity. As God is forcibly removed from our schools, ignorance becomes its new king. Ironically, what was supposed to be a house of true knowledge has devolved into a stronghold of willfull ignorance. This is a self-perpetuating problem, and no amount of teachers' raises and funding or law-makers' fiscal responsibility is going to fix it. The system is doomed from its very foundations. The foundations need to be repaired before anything else teachers or law-makers do will have any lasting effect. Any "progress" will only appear to be great, but in reality it will be weak- another existential credit to the teachers and/or law-makers to inflate their egos and increase their vanity for the next school year or election cycle. But, what happens when the law-makers want to save more money and cut funding again, or what happens when the teachers want yet another raise or more funding for their classrooms? Will there be more of these embarrasing displays? Unless Christianity is allowed back in schools, true knowledge of our world cannot and will not be the focus of our education system and the cycle of futility will continue until it self-destructs. It will not be until our educators and law-makers reexamine their philosophical foundations and place God back where He belongs at the foundational philosophy of education. If that happens, then knowledge will no longer be subject to utility (the overrated and incorrect philosophical order); utility will be subject to knowledge (the properly rated and correct philosphical order). Education is valuable, and teachers have a most nobel calling, but unless the philosophical foundations are corrected and our teachers are permitted to teach the next generation the pursuit of knowledge, they will be merely teaching their students to chase the wind. UPDATE (4/12/18): The teacher walkout in Oklahoma has ended. Here is an article. 1Nash, R. H. (1990). The Closing of the American Heart: Whats really wrong with Americas schools. Dallas, TX: Probe Books. I agree that the problems do stem from the missing foundational knowledge base mentioned in this blog, but in addition, the selfless cooperation that cannot arise in the current system is not only lacking because of a lack of knowledge (versus credentials) but from a lack of morality- also based solidly in God. The One who made us was meant to be the One who rules us, and life simply does not work without Him- and that includes His revelation, rules and redemption. Of course only in Christ can we have a proper and accurate moral perspective, much less the power to submit to His rules and standards. I think you consciously or subconsciously made a "secular" argument for knowledge vs credentials (a more culturally acceptable stance) but you recognized the necessity of God and His order as the source of that knowledge. In reality that alone is not enough to turn the tide. There has to be a return to morality and decency, not just a turn to knowledge vs vanity and credentials. And only Christ can bring that change. This is why education is not the answer- even proper education. Our society cannot be swayed with logic, sin prevents it- and only Christ takes away sin. The knowledge of Christ Himself is the only answer for humanity in all arenas. Indeed. That is precisely how the only way to "save" the system is to bring Christ back. Not only will the Christian worldview provide the ground for knowledge (that is required for moral knowledge), but it will also provide the content of moral knowledge. At least that will be in place; however, it is up to the individuals being taught by the system to accept their own sinfulness and Christ's sacrifice. If the system is built upon the true worldview, then the environment is set up for discovering truth and building God's Kingdom in the process. Luke, my wife has taught in a state secondary school here in Scotland for 35 years so I have a passing interest in education and some knowledge of teachers. I would certainly agree with some of what you say here, particularly that education should move away from a focus on credentials to knowledge and understanding of the world and I don't think I've ever come across a teacher who would disagree with that view but unfortunately teachers don't have much, if any, control over the curriculum. I don't know exactly how the education system works in the USA but I would imagine the same applies. As you recognise, the people who get to decide how much money the education system receives have, quite rightly, to justify to tax payers how their money is being spent and so far no one has discovered a way of doing that in a politically-acceptable manner that doesn't involve recognisable credentials, exam league tables and so on. I'm interested in your view that Christianity has been excluded from the education system there. I wonder how this exclusion is manifested, presumably religious education classes are included in the curriculum as they are here? You've certainly highlighted a problem in this post but I would like to see you offer a more detailed solution to the problem; for example, how you would restructure the curriculum to include the Christian world-view. World religion classes are usually taught with the idea that no particular religion is true or that they are all true. They do not encourage testing the religions because they are taught within the epistemology of Kant, which holds that ultimate truth cannot be tested or known. A change would not just have to take place in how world religions are taught, though. What needs to be changed is the foundational epistemology of the entire system (all subjects). All curricula would have to be edited to include a philosophy of that subject that allows for true knowledge to be known and various ideas taught to be testable against the world. Everything from history to mathematics would have to be taught within this epistemology. Along with Nash's book that I referenced, another great book of his would be "The Word of God and the Mind of Man" that I have reviewed (you can find it on the Book Reviews page). Another book that I would recommend (that specifically deals with philosophy of history) is "The Bible Among The Myths" by John N. Oswalt (also on the Book Reviews page). The first change, though, that I think should be enacted would be teaching logic (age-appropriately) across all grade levels. This would help lay a foundation for how to think (not just want to think) that would allow for the testing of the content across the other subjects for truth. As false information is identified, it should be skipped over until creators are able to remove it from the resources (certainly not something that would take place overnight). I think this is a logical and necessary first step. While I have an idea of how I think the process would progress to ultimately get to the teaching of content because it is true (and not just pragmatic), the process may take more time and maybe take a different path than I envision. But I do believe that if we are to get to where we need to be, the introduction of logic is a necessary first step. I'm slightly wary of the idea of introducing logic as an isolated core subject. I spent 5 years at university studying philosophy with a year of that being a very intensive study of logic and I have to say that logic by itself, stripped of humanity, can produce some very odd and illogical results. Certainly a solid grounding in reasoned argument to challenge assumptions and false information would be an excellent first step but there's more to reason than mere logic. Your idea that the philosophy of each subject should be added to the curriculum is, naturally, something of which I approve although I think teachers might say that it's already hard enough to teach their subjects without adding that extra layer but if they didn't have to waste time teaching exam preparation, then it would fit in without problem. The idea that all of this should be based solely on Christianity would, presumably, require an absolute proof of the correctness of this belief system without any possibility of dispute or doubt. I'm not sure that this level of consensus and certainty has been achieved yet. Chris, I agree that logic alone is dry and can be harsh if you are presenting sound deductive arguments with unpopular or undesirable conclusions. Deductive logic, though, is not the only type that should be taught. Inductive and abductive are necessary as well. Further, how to communicate with love and respect ("...gentleness and respect..."- 1 Peter 3:15) should also be part of it. There is no need for absolute proof of the truth of a worldview or a conclusion for someone to reasonably know it is true. In this particular case, though, if Christianity is false, then logic, our senses, and our cognitive faculties have no grounding to be reliable, thus knowledge is impossible, The truth of Christianity is not an unreasonable assumption to make if we value knowledge. If someone is going to require absolute proof of the ground of knowledge before they will accept the ground of knowledge, then what in the world grounds their objection? One cannot claim to have knowledge that knowledge has no ground, and they certainly cannot trust such a conclusion if their cognitive faculties are the product of a mechanism that favors useful fictions because they aid survival and reproduction. I know many teachers who detest exam preparation, so I think many would be happy to see that go. Especially if it was replaced with true understanding of the material that will help the student be able to answer questions regardless of how the questions are presented. Today, exams only test memorization; they do not test understanding. I believe that many teachers would welcome the shift of focus.